Buttons, feathers, hats, jewellery, embroidery, shoes, flowers – meticulously handcrafted gems that bring alive the concept of couture. 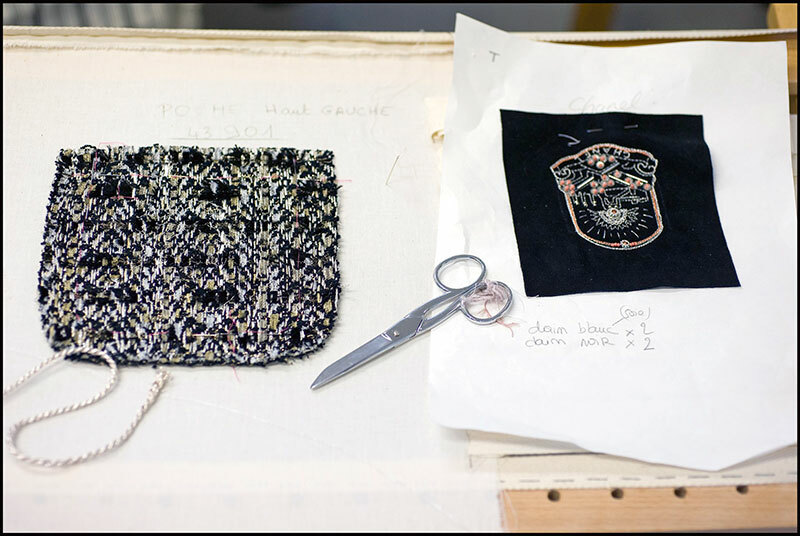 Chanel acquired these exquisite ateliers with the sole purpose of preserving the craft they excel in – the workshops are encouraged to develop their own business outside of the brand and often work on collections for other Parisian couture houses as well. Independence, creative license and building constantly on a significant heritage is what these ateliers stand for today. 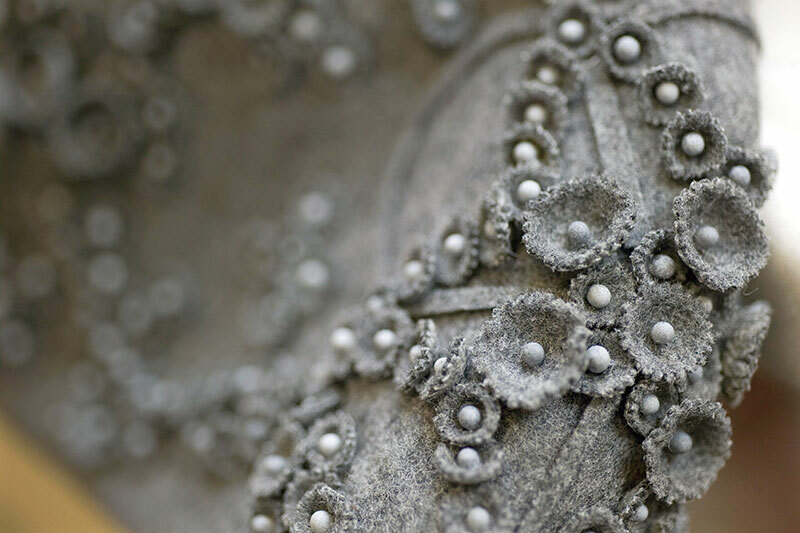 Seventy years in the fashion business; an archive of 80,000 buttons and baubles. Producing about 4,000 buttons daily, the Desrues atelier works skillfully with materials like copper, silver, wood, mother-of-pearl, resin. 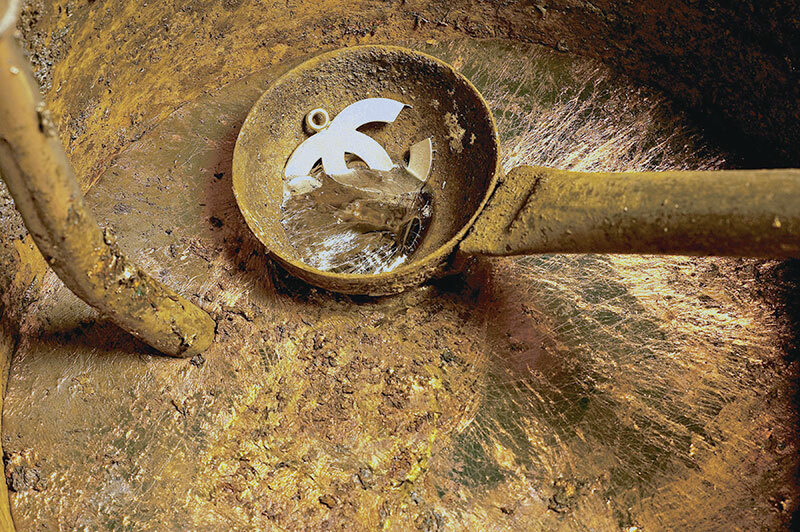 A ‘maquette’ or prototype, arrived at through Chanel’s ideations, helps to create a sculpted mould through which alloys are processed, buffed, dyed, chiselled and polished. Forty thousand flowers every year, ranging from dahlias, peonies, marigolds, tulips, orchids, and roses. 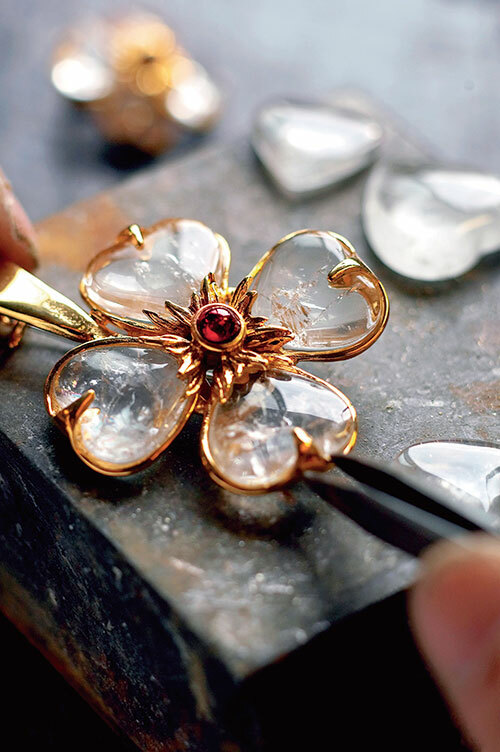 Chanel’s ultimate signature – the camellia, which boasts a minimum of 16 petals, was first conceived here and to this day, the atelier produces the much-loved floral emblem for the brand. From luxe elements like satin, fur, velvet and leather to the more unusual newspaper, cardboard and plastic, the camellia resurrects and transforms itself constantly through the deft hands at Lemarié. Other feathery and floral accoutrements are also produced here – yards of ruffles, panels of pleats and an abundance of frill and flounce. Nineteen fifty-seven, the year that Gabrielle Chanel commissioned the now iconic, two-tone, six-centimetre heel beige kidskin and black satin toe pump. A dozen craftsmen today work round the clock to custom make boots, ballerinas, mules and sandals. Thirty hours of human labour goes into creating a pair for the ladies, pumping up to 50 hours for a men’s pair. 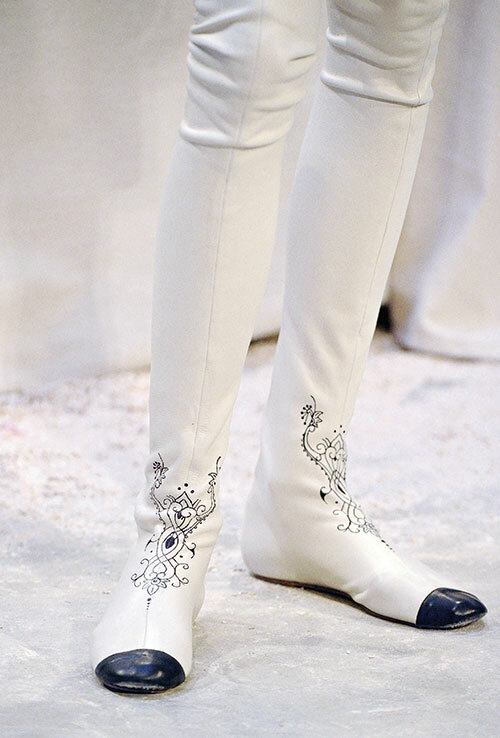 The Paris-Bombay collection included interesting details like imprinting traditional silver vase filigree on to boot heels and stencilling of Indian motifs on to pure white leather. 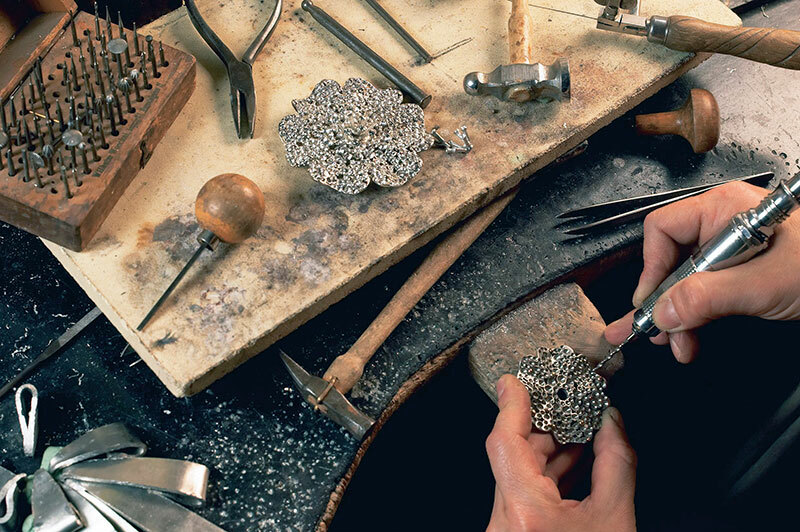 The Goossens goldsmith adeptly casts pieces in gold, bronze and silver and many other metals to melt, hone and transform a lump into a finely sculpted piece of beauty. Gabrielle Chanel met Robert Goossens in 1953 and therein began a gilded relationship inspired by antique, Byzantium and Egyptian heirlooms. Today, Goossens does not specifically produce jewellery for Chanel but instead focusses on the interior decorations and details for the brand. 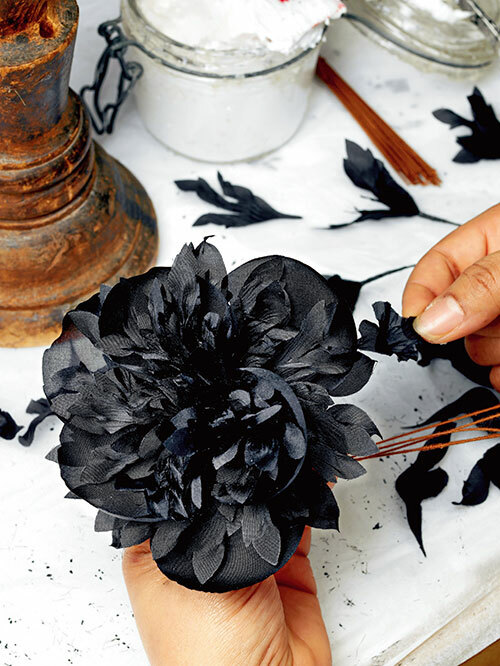 It’s a veritable hothouse of colour and texture in the floral kingdom of this workshop. Guillet works more on the production side of affairs for Chanel, transforming silks, muslins and velvets into artistic flowers with sequins, ribbons and a host of techniques. The ‘flower seamstresses’, as they are fondly called, shape the petals of roses, lilies and lavender through a specialised heated iron process, embossing, chiselling and moulding as they go along. Hats and headgear – helmets, caps, berets, bonnets, turbans…milliners Michel make for the crowning glory of the ateliers. With an array of 3,000 linden wood heads acting as bases, Michel’s work force gathers together to create impossible-to-imagine creations in straw, felt, vinyl and almost any material that Chanel may deem fit. The process here is compartmentalised and exclusive to skill; the hatter is solely responsible for shaping the hat and the milliner is the one who sews and decorates it. Sixty thousand embroidery samples and counting, the biggest collection anywhere in the world. Working with opulent tassels, stones, beads, crystals, cabochons and ribbons, this atelier adds about 100 new samples to its burgeoning repertoire every year. 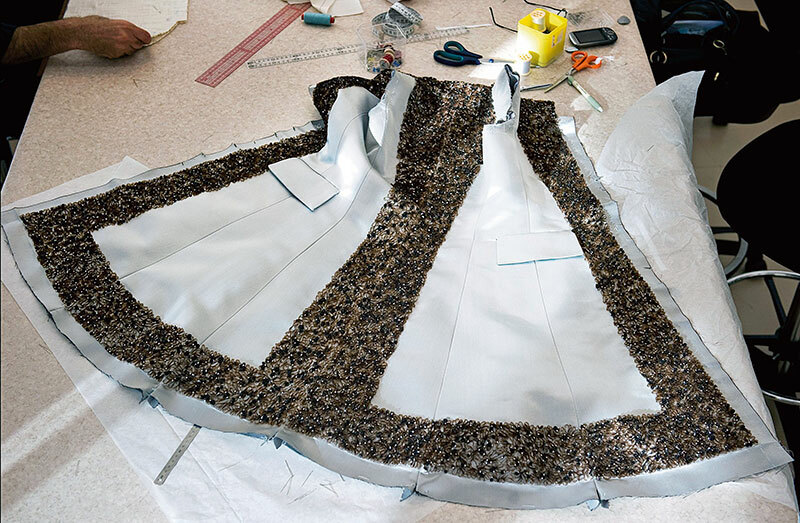 A hefty 30 kilos of beads and over 100 million sequins are used up by the workshop on an annual basis. ‘Vermicelli’ beading or the concept of ombré blend beading was first conceived here. 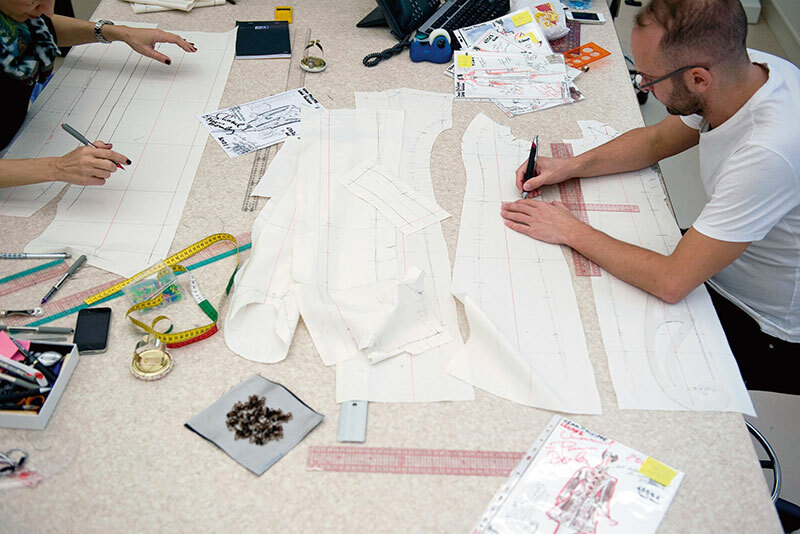 Karl Lagerfeld’s vision and ideation come alive with a sketch in the Chanel workshop, which grows in dimension through draping and pinning of a fabric on a wooden mannequin. This draped form is then recreated in the specified fabric before being cut out in sections for embroidery, appliqué or texturing. The entire process takes place about six weeks before the show date. As seen above and below, the artisans at Lesage have worked on a pre-approved needlework sample, bringing a pattern to life on a coat from the Paris-Bombay collection. Once finished, the pieces are sent back to Chanel for assembly; this stage involves constant proportion checks on the mannequin before a final fitting on the model at 31, Rue Cambon, Chanel’s headquarters. The garment is then ready to cast its spell on the runway. Scalloped windows or Indian ‘jharokhas’ as they are called, form a beatific frame around smudged filigree mirrors. A seemingly endless long table showcases gold-plated crockery, Belgian cut crystal goblets and tiered platters of chutneys, Gujarati farsan, and Punjabi cocktail snacks. Champagne and mango lassi flow freely. The centrepiece table, another never-ending line-up of exotic fruits and aromatic mogra, also displays a miniature royal train, whose passengers are a bunch of intricately crafted liquor decanters. 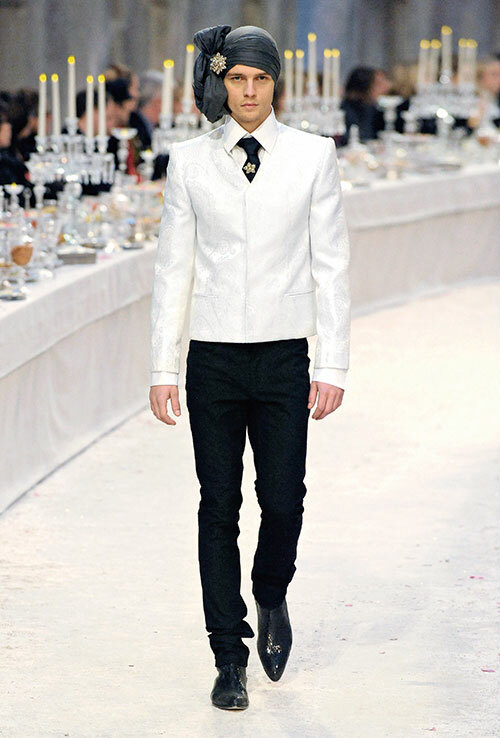 Karl Lagerfeld, in true Chanel style, transports everyone to this land of the Indian Royal, in the heart of Paris, at the Grand Palais – an opulent Maharaja’s banquet, seen through the eyes of France. The musical strains of George Harrison, John Lennon and David Lynch couple with those of RD Burman, Asha Bhosle and Ravi Shankar. There is much of India, but purely through a Chanel aesthetic. 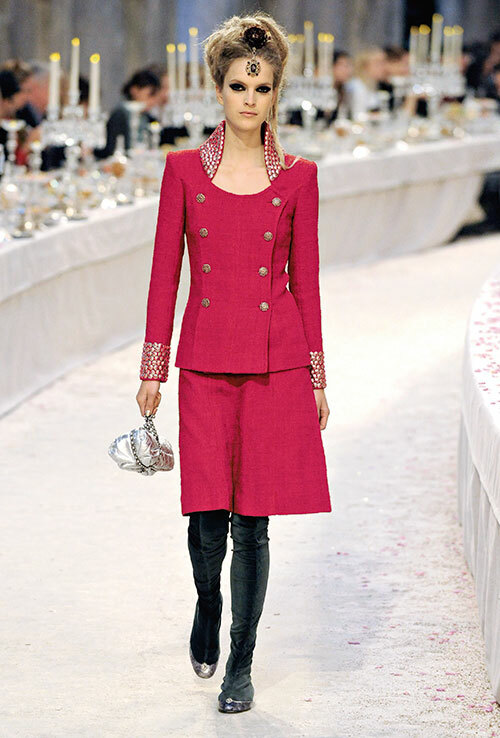 Rani pink, Nehru collars and sari silhouettes modify their persona to become soft shouldered tweed jackets, flared panel skirts in duchesse satin and dresses of lace and muslin. Nathnis, maang tikkas, defined kohl eyes and sadhu-style dreadlocks knock shoulders with vintage worthy pearls, sharp cuts and equestrian boots. It is, as Lagerfeld himself admits, a ‘concept’ of his India, of Chanel’s India.